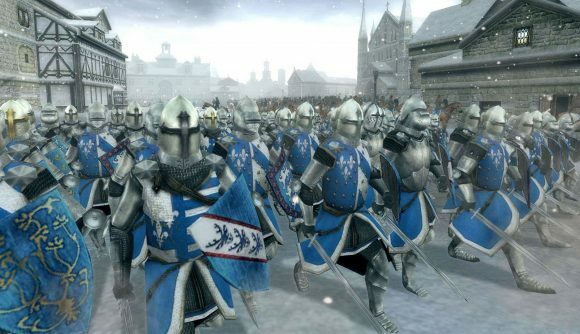 Creative Assembly has announced it is giving Empire: Total War, Napolean: Total War, and Medieval II: Total War a Definitive Edition upgrade. Better still, if you already own the games, the upgrade will be a free update. Now, these Definitive Editions aren’t the 4K overhauls that we’ve seen for Age of Empires (or that are in the works for Command & Conquer and Red Alert). Instead, they’re bundles of the base game and all the DLC released for the title. What this means if you bought one of the base games is that you’ll be gifted all of the DLC free of charge. So, for Empire: Total War, you’ll end up with Elite Units of the East, Elite Units of America, and The Warpath Campaign. Medieval II comes bundled with the Kingdoms expansion. And Napolean: Total War is fleshed out with Coalition Battle Pack, The Peninsular Campaign, Imperial Eagle Pack, and Heroes of the Napoleonic Wars. There’s a short video announcing the new editions that you can watch below. This is great news for all of you who haven’t picked up all of these expansions in the past. Personally, considering Medieval II: Total War is now 12 years old, it gives me hope that in 2027 I’ll be able to pick up all the DLC for Total War: Warhammer in a free update.